Police were forced to open fire at a home in La Mesa when confronted by an aggressive dog on March 5 while responding to a domestic disturbance. Two shots were fired at the dog but did not hit the animal. No officers were injured. After the incident, the dog was taken to the El Cajon animal shelter. The incident occurred at the 7000 block of Grape Street and Maple Avenue. After over three years of litigation, Grossmont Union High School District (GUHSD), Alpine Union School District (AUSD), and the Alpine Taxpayers for Bond Accountability (ATBA) have resolved the final issues in their litigation regarding a potential new high school in Alpine. A resolution was reached under which Alpine Union and the ATBA have agreed to forego an appeal of the California Court of Appeal’s decision and Grossmont has agreed not to seek recovery of its court costs from Alpine Union and ATBA. All parties have agreed that their collective efforts are best spent on supporting the success of all East County students. “This settlement is yet another sign of improved relations between our districts and another example of the two districts’ dedication and focus on serving our East County students, families and communities,” said Grossmont Superintendent Dr. Tim Glover. “Dr. Glover and I strongly believe it is essential for our districts to work collaboratively to forge positive relationships dedicated to improving student outcomes and preparing all students to achieve their potential for success in life, career and as contributing members of society” said Dr. Newman, AUSD Superintendent in a press release. Under the settlement agreement, AUSD, ATBA, and the ATBA members have agreed to abide by the decisions of the trial court and the Court of Appeal, which found that GUHSD’s and former Superintendent Swenson’s actions were sound and reasonable exercises of their discretion with respect to the new school and that Proposition U’s enrollment condition for construction of a new high school in Alpine has not been satisfied, therefore GUHSD is not authorized or obligated to begin and complete construction of the new high school. GUHSD, however, remains committed to building a new high school in Alpine when the conditions are appropriate for doing so. The parties wish to state publicly that they will together focus on the best interests of the entire district. The Arbor Day Foundation, in honor of its commitment to effective urban forest management, has named La Mesa a 2017 Tree City USA for the 38th consecutive year. La Mesa achieved Tree City USA recognition by meeting the program’s four requirements: a tree board or department, a tree-care ordinance, an annual community forestry budget of at least $2 per capita, and an Arbor Day observance and proclamation. More information on the program is available at bit.ly/2HxJAsG. Undeterred by a rainy evening, the La Mesa Arts Foundation and Grossmont High School Educational Foundation held their annual fundraiser galas in La Mesa on the very same night. The Arts Foundation event, called Party in the Stars, benefits the La Mesa Arts Academy (LMAAC) and took place at the La Mesa Community Center. This party featured a California surf theme and included two bands, a live and silent auction, and a diverse array of delicious food. A large and enthusiastic crowd applauded loudly during a video highlighting the program opportunities and successes of the arts academy. The academy is a fourth- to eighth-grade arts-focused school within the La Mesa-Spring Valley School District. The arts foundation provides needed additional funding to support classroom and school wide events and enrichment. 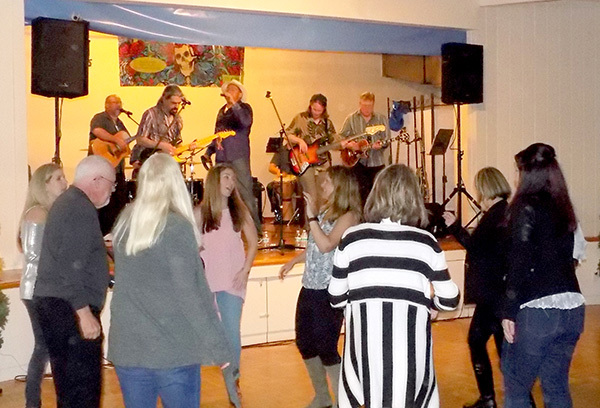 The Grossmont High School Educational Foundation’s party, held at the La Mesa Women’s Club and called The Rock n’ Roll Dinner Dance, was a more modest, but no less spirited affair. While this event also featured a silent auction and fantastic food, the highlight was a local band, The Grateful Dads, comprised of parents who met through their children’s school and sports teams. The foundation raises money for scholarships, grants, and other educational needs at Grossmont High School. More information on each foundation can be found on their respective websites, lmartsfoundation.org and foothillerfoundation.com. St. Martin of Tours in La Mesa now runs on Sullivan Solar Power. The local Catholic parish, which is also home to the St. Martin of Tours Academy, flipped the switch on a 68,020-watt solar system. They anticipate saving more than $1,484,900 over the lifetime of the system, which will be reinvested into the church, on-site academy and 1,500 families that St. Martin of Tours serves. The solar powered system is comprised of 213 SunPower modules, with an expected useful life of more than 40 years. The Sullivan Solar Power system is expected to generate over 3,555,200 kwh, which is the equivalent to 6,126 barrels of oil not consumed. Sullivan Solar Power will continue to monitor the system, ensuring both the cost savings, health and environmental benefits of the solar system. “Sullivan Solar Power is proud to assist St. Martin of Tours Catholic Church in declaring energy independence, which is reducing their carbon footprint while saving funds that can be reinvested into the La Mesa community,” said Daniel Sullivan, founder and president of Sullivan Solar Power. For more information about Sullivan Solar Power and the Catholic Solar Program, visit bit.ly/2HwMQ81.